You can feel right at home with the numerous included amenities and onsite facilities available for you to enjoy. Each guest room comes complete with a flat screen TV, free high speed Wi-Fi connection, microwave, refrigerator, and more. You can spend the day resting up or relaxing in the indoor heated swimming pool and hot tub. To complete your best hotel room stay, you can enjoy a fresh hot full breakfast bar served each morning. Fresh fruit, hot and cold items, and fresh coffee are available every day. 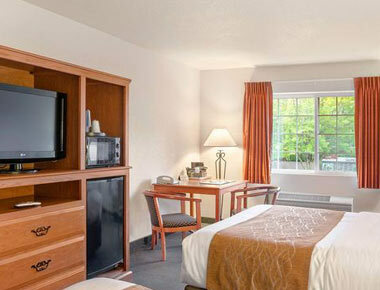 The hotel rooms offered at the Comfort Inn & Suites Tualatin-Portland South are spacious and comfortable, featuring larger standard guest bed sizes and a variety of different guest room styles for any need. Travel parties large and small can find everything that they need for a memorable stay, as well as a great night’s sleep. Solo travelers, business travelers, couples vacationing together and families can find the perfect accommodations for their entire group. The single queen bed guest room is a great value that provides a ton of comfort for any solo traveler or for couples traveling together. This larger standard guest bed comfortably sleeps up to two guests and features all of the same great standard amenities as our other guest room selections. A second large queen bed makes this guest room option a fantastic value for any family getaway or larger traveling group. 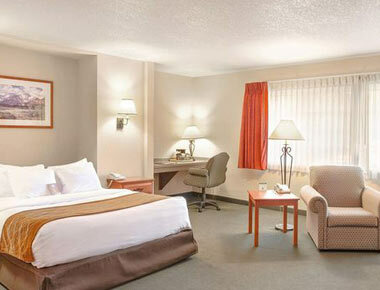 Two large queen beds provides ample space for everyone to relax with the in-room cable TV, free high speed wireless Internet connection, and have a great night of rest and relaxation. A single king guest bed room is ideal for any smaller group looking for more comfort and value. Our largest bed option is perfect for up to two guests, or four with a sofabed option. Included in your stay is access to the indoor swimming pool area, as well as onsite fitness room. 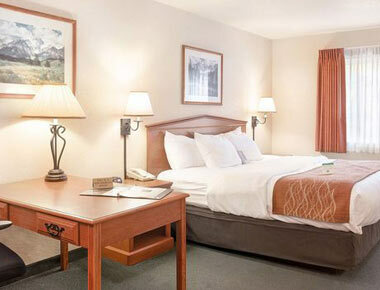 Guests who are looking for the most amount of comfort possible will love the king bed guest room with private hot tub. 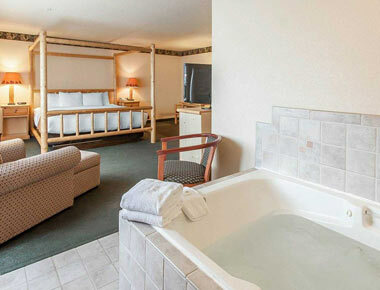 The jetted tub is adjacent to the bed and is ideal for unwinding from a long day of travel. This is the perfect option for a couple’s retreat or for the best in solo traveler lodging. We have several room types available with accessible features. They are the King Accessible Room with a roll-in shower with grab bars and a Suite with grab bars.